We have been getting THE most beautiful, incredibly tasty, heirloom tomatoes from our CSA and our own mini-garden the past few weeks. Mostly we just eat them warm off the vine, sliced, with a drizzle of good olive oil and some coarse salt and pepper. Tonight I baked a loaf of "sourdough 5 minute a day" bread, sliced it length wise, toasted it, and rubbed it with a clove of garlic. 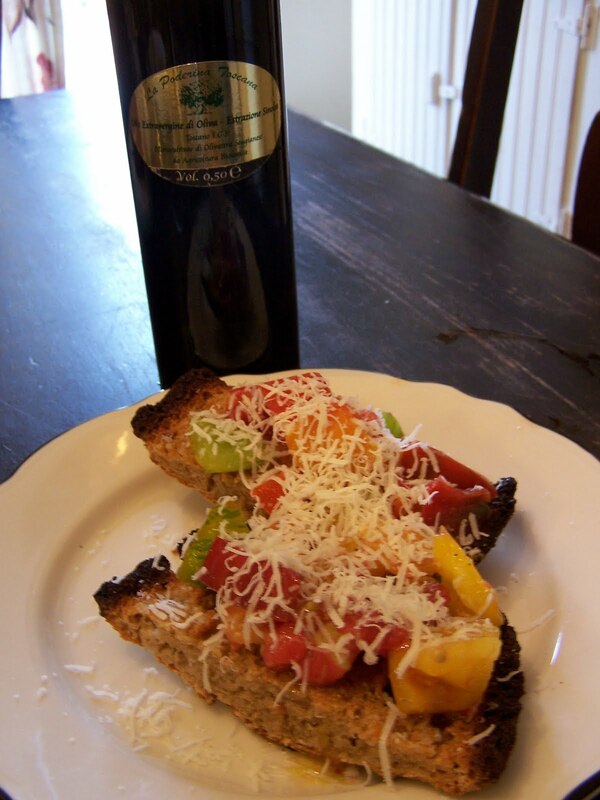 While the bread was baking, I cut up a few of the tomatoes and drizzled them with some of the best olive oil EVER. It was the perfect oil for our bruschetta tonight. I've been working on a review of this particular olive oil and I can honestly say it is THE best I have ever tasted. We have had it drizzled over fresh sliced tomatoes. We have tossed it in hot pasta with just a bit of freshly grated parmigiano reggiano. How you say "love" in Italian? meant to ask where to get the best ever oil? I came across your blog I think through Reagan Family Farm blogs...or was it Prarie Flower Farm..can't remeber.. :) I enjoyed reading and seeing all your yummy recipes..I also saw your deoderant post..gonna have to try that..I also noticed you have the Background fairys templates..I have hers as well..but can't seem to get the brownish color on the main page..how did you do it? If you have a chance can you stop by and see..my side is good but the middle still remains white..Any help would be great..
One of our favorite Summer Treats! Makes my stomach growl thinking of all the goodness! Didn't we talk about you coming to cook for me??? Our tomatoes were a bust (along with pretty much everything else...hmmmm) but love this dish! I'm pretty tempted re:Thursday, and Jenna says "go", but transportation may be an issue (among other little details)but I'll let you know. Sounds wonderful! I am thinking I need some of this amore! Saw your post title at Homestead Revival and had to come see... I get corrected all the time when I say bru-sket-a. It looks like you have a lovely place full of good information here:) Looking forward to peeking around. That's something I've always wanted to do, try different kinds of olive oil. I'ts good to know that there is one I know already is good to try. Thanks! This winter maybe it will be the year to try the different olive oils. Of course I'll have to find them and that isn't something too readily available in a middle class diet area. You're making me cry with all the references to your lovely tomatoes. Here in Montana, we just don't get much tomato love.